“For Your Consideration” season has begun. I know this because the first Oscar screener of the season has been leaked online. A week and a half before the official release date, Ridley Scott’s new film American Gangster has been uploaded to the bit torrent networks and has already been illegally downloaded by tens of thousands of people. And that’s just in the first 20 hours online. As I write this, over 10,000 users are currently downloading the video off a popular bit torrent website. Audiences usually stay way from pirated movies due to the notorious bad quality video camera-taped copies. But with Award Season screeners, the movie quality is as good as a retail DVD release. So what is to stop consumers from downloading this film early? 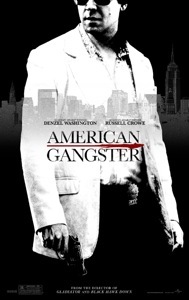 American Gangster is set to hit theaters in he United States on November 2nd, but its release in other world territories happens as late as February of 2008. So while this might not have a huge effect on the box office in the U.S., it is likely to hurt foreign markets hard. And as for the U.S. results, that is debatable. Recently horror director Eli Roth blamed piracy for the lower than expected box office numbers of Hostel: Part II. The workprint for his film was leaked online a week before the movie’s national release.